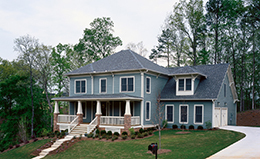 Use Your Personal Designer to Choose Home Siding Colors and More! 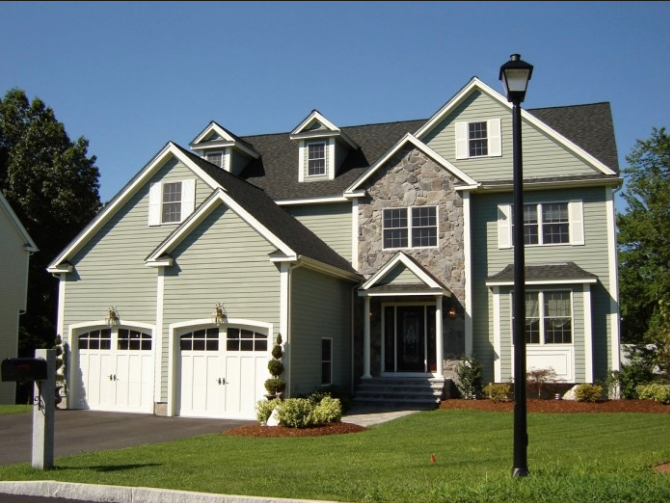 As home exterior experts, Carp’s Complete Exteriors crews specialize in James Hardie siding and trim installation. If you’re looking for a home remodeling contractor you can trust, contact us. We have earned a reputation for the highest standards in quality work and design, and are customer recommended. Carp’s Complete Exteriors also installs siding, roofing, gutters and so much more. Contact us to upgrade your home’s exterior with quality products at a fair price. 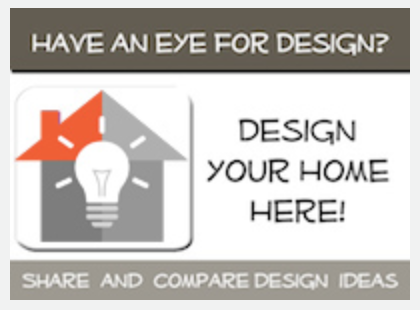 Use the Your Personal Designer tool to see the design possibilities for your home, then call Carp’s to add the finishing touches of beauty and value that will last for years to come. 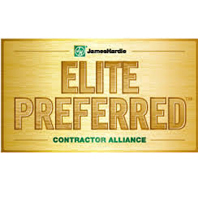 Carp’s Complete Exteriors is proud to be Nebraska's only James Hardie Elite Preferred Contractor. As a James Hardie Preferred home siding contractor in Omaha, Nebraska, Carp’s Complete Exteriors has consistently demonstrated high standards in quality, professionalism, and customer satisfaction. For an exceptionally beautiful home, choose America’s #1 exterior siding product installed by Carp’s Complete Exteriors, a James Hardie preferred home remodeler in the Omaha, Nebraska Metro area. Carp’s Complete Exteriors excels at installing a wide range of James Hardie color profiles, providing you superior performance over time. Carp’s Complete Exteriors installs America’s #1 brand of siding and the only trim with the character to stand beside it. This contractor will ensure your home looks beautiful longer by choosing 100% HARDIE siding and trim. Carp’s Complete Exteriors earned the highest level of homeowner recommendations based on customer satisfaction data from GuildQuality, the industry leader in third party surveying. 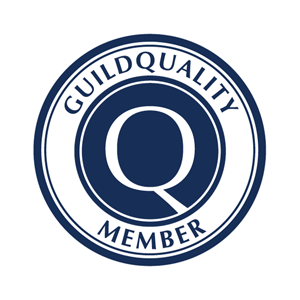 Read more of Carp’s recommendations at GuildQuality.com. Stability and dependability is important to our customers. This badge signifies the number of years Carp’s Complete Exteriors has been in partnership with James Hardie. 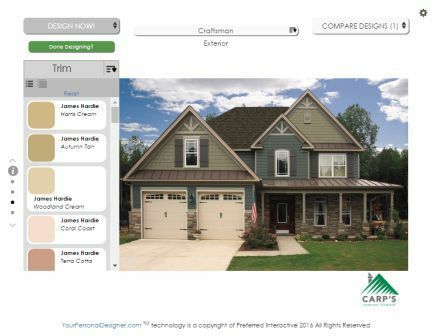 Carp’s Complete Exteriors excels at installing a wide range of James Hardie product profiles, providing you differentiated design options when planning your James Hardie siding project. 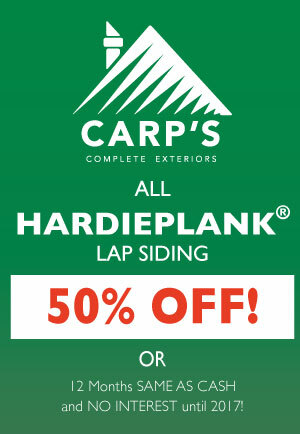 Contact Carp’s Complete Exteriors for your free James Hardie siding estimate, and take 50% off James Hardie lap siding! Installed on over 5.5 million homes from coast to coast, James Hardie® siding products are designed to resist the most extreme conditions while romancing the senses. You will enjoy the warm, natural character of the leading siding product on the market with unprecedented peace of mind. If your home is in need of siding repair, new exterior siding, or you’re wondering, “Can you paint vinyl siding?” you might need to stop and look at your options! James Hardie is the market leader - with siding products specifically engineered to ensure the beauty and longevity of your home’s exterior. James Hardie offers homeowners an unrivaled collection of siding design options with exceptional warranties. James Hardie siding uses the highest quality raw materials and proprietary additives for enhanced strength and moisture protection. Baked-on color delivers a beautiful finish that resists fading and makes a lasting impression Advanced ColorPlus® finishes deliver the ultimate in aesthetics and performance, creating beautiful and durable house siding. James Hardie siding products aren’t simply painted at the factory like most vinyl or metal siding panels. Multiple coats of color are baked onto the Hardie board siding for a vibrant, consistent finish that brings years of lasting character, adhesion and fade resistance. The proprietary coating is engineered for superior adhesion to James Hardie substrate. Carp’s Complete Exteriors can apply this to all surfaces, edges and features for durable siding performance. Unlike other types of siding, such as vinyl or aluminum, James Hardie fiber cement siding is finished for superior color retention and natural weather resistance. 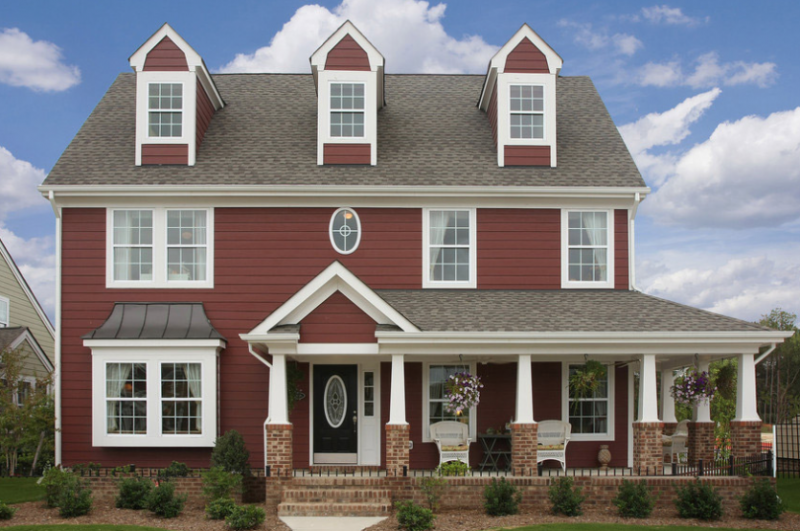 James Hardie siding colors offer homeowners an array of options. For James Hardie colors, the finish is cured onto boards after each coating step for a stronger bond, which allows for exceptional resistance to cracking, peeling and chipping. Compared to vinyl siding and paint on other siding products, the James Hardie multi-coat, baked-on finish retains its vibrancy longer - in all UV conditions. A well-designed house should make you happy whenever you see it. The last thing you need is anxiety about how your siding is performing. Reliability is crucial. That’s why so many people choose James Hardie siding and trim. 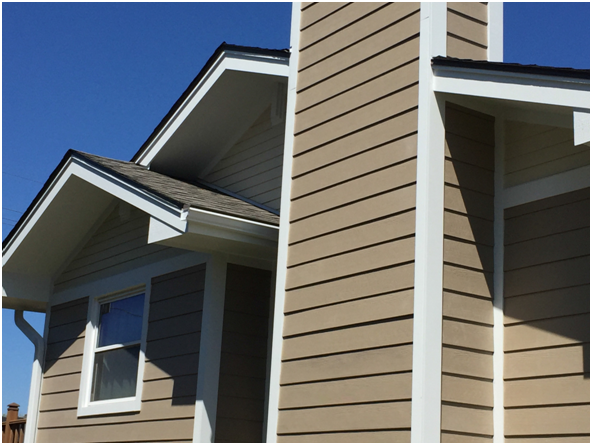 James Hardie® fiber cement siding products combine beautiful design with high performance. Time and time again, James Hardie beats the competitors on both curb appeal and durability, leading the industry in customer satisfaction. James Hardie siding and trim products are Engineered for Climate®, so even with the fluctuating seasons that we have in Omaha, Nebraska, you can rest assured that your investment is going to stand up to Mother Nature. James Hardie fiber cement siding is specifically formulated to better resist damage from moisture, freezing temperatures, humidity, pests and fire--providing the best protection from elements that pose threats to wood-based or vinyl-based siding products. There are many reasons to choose James Hardie siding over other types of siding, the first of which is appearance. James Hardie siding is over five times thicker than vinyl, allowing for deeper grooves and a more authentic wood-grain effect. The result is more elegant than vinyl (which is plastic), particularly on siding for a historic home. Then comes function. James Hardie siding products are noncombustible, more durable than vinyl and wood in a fire, and also resist warping, sagging and melting. James Hardie siding is not only less expensive than wood siding, it won’t be eaten by animals or insects. It also resists water absorption better than wood to protect against mold. Feel confident in choosing an exterior siding product designed for both beauty and durability, that’s installed by a James Hardie Preferred Remodeler. 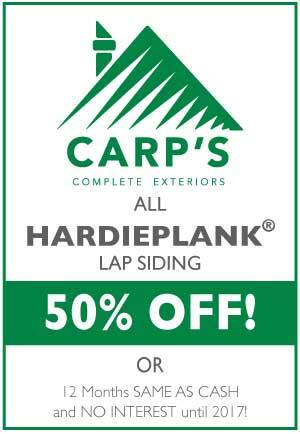 For a limited time, contact Carp’s Complete Exteriors to receive 50% off Hardieplank lap siding! Your James Hardie prefinished concrete siding will not have to be repainted for at least 15 years. Plus, you may be able to save up to 20% on your homeowners insurance. Contact Carp’s Complete Exteriors to install your James Hardie concrete siding - and love your new home. Choose Carp’s Complete Exteriors as your James Hardie fiber cement siding contractors. The people have spoken! James Hardie® siding products are ranked #1 by Angie’s List members for industry-leading quality, durability and curb appeal, according to a volunteer survey of Angie’s List members conducted by an independent party in November 2015. James Hardie fiber cement exterior siding is the most popular brand of home siding in America. When you buy James Hardie siding products from Carp’s, you can count on lasting quality and beauty that results in return on investment for your home. Since James Hardie fiber cement board siding (unlike vinyl or wood) is non-combustible and resistant to hail-damage, it can sometimes help homeowners reduce their insurance premiums. Talk to your agent for more information. James Hardie plank, panel, shingle and soffit products come with a 30-year, non-prorated limited warranty, and trim products have a 15-year non-prorated limited warranty. James Hardie products with ColorPlus® Technology finishes come with a 15-year limited warranty that covers paint and labor, protecting against peeling, cracking, and chipping. Fiber cement siding options from James Hardie offer the most reliable finishes, and are engineered for durability and performance - to increase the beauty and value of your home, year after year. Carp’s Complete Exteriors is a professional siding contractor you can trust. As an aligned James Hardie Installer, Carp’s Complete Exteriors strives to exceed your expectations. We hold ourselves to the highest standards when it comes to your home’s exterior siding project. We ensure your complete, guaranteed satisfaction. Our trained and certified crews are dedicated to clean jobsites, and careful workmanship with attention to every detail. Carp’s gives homeowners peace of mind with our expert installation, high quality siding products, and the area’s best warranties. Carp’s Complete Exteriors is known throughout the Omaha, NE area for our top notch customer service and proactive project updates.